On March 11, most Americans will spring forward an hour in observance of daylight saving time, a ritual that has been repeated for nearly a century. The first observance began on March 31, 1918. By advancing time ahead one hour on the last Sunday in March, workers in wartime defense industries had more daylight to be more productive. The U.S. economy moved to an accelerated pace during World War I, requiring farms and factories to maximize their production. But no matter how efficient machinery or workers became, there were still only 24 hours in a day. If working hours could be adjusted to begin earlier, just after sunrise, and end well before sunset, a “saving” of one useful daylight hour for work or recreation might be achieved. United Cigar Store Company produced this poster promoting daylight saving in 1918. The U.S. government decided to follow the example of several European nations in skipping clocks ahead. Shifting daylight hours from the morning to the evening saved fuel, oil, and electricity, since more work would be done before dusk. As an added bonus, after a long day in the factory, a worker could put his or her extra daylight hour to use in gardening or recreation, resulting in a healthier workforce. Military recruits could also remain in the field to train just a little longer each day. "Daylight saving will aid our war gardens" predicted the Wells Fargo Messenger magazine in April 1918. 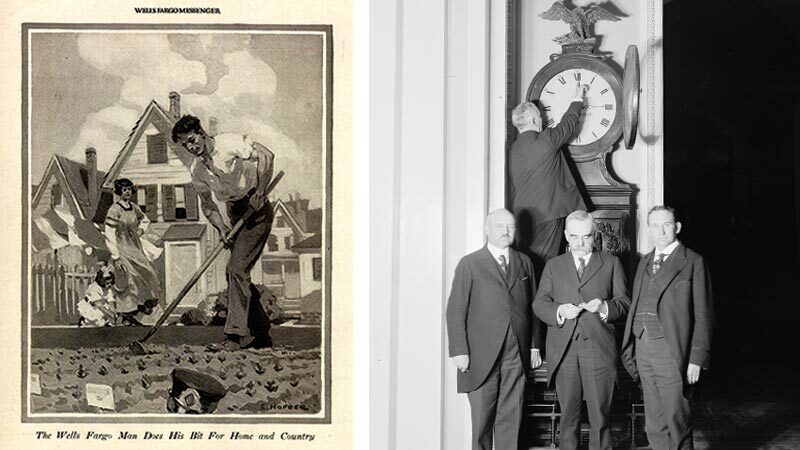 Artist Edward Hopper's illustration of a man tending his vegetable garden ran in the June 1918 issue; a clock in the U.S. Capitol is set forward one hour on March 31, 1918. On March 19, 1918, Congress passed “An Act To save daylight and to provide standard time for the United States,” which also divided the continental U.S. into five time zones by longitudinal degrees: Eastern, Central, Mountain, Pacific, and Alaska. The time shift lasted seven months: from March 31 until the last Sunday of October, when Americans subtracted the hour, reverting back to standard time. The World War I era daylight saving practice expired in 1919, but President Franklin D. Roosevelt revived it as “War Time” from 1942 to 1945. Setting clocks one hour ahead to daylight saving time became an annual springtime ritual for most Americans in 1966, when federal law officially made the time change uniform throughout the nation. Individual states could opt out, however. Even today, two states — Arizona and Hawaii — do not observe daylight saving time.